As your children grow and their needs change, so does the way they use spaces within the home. Children tend to grow out of the need for a dedicated playroom after a certain age, preferring to spend more time in their bedrooms. My recent clients in Concord had arrived at this very juncture of their lives. They had a lovely room, under-utilised by the children and they were desperately in need of a dedicated study space. We added doors to the room for privacy, but kept it light and airy with the use of glass panelled doors. A large bookcase was brought in to house photos, books and work related materials. 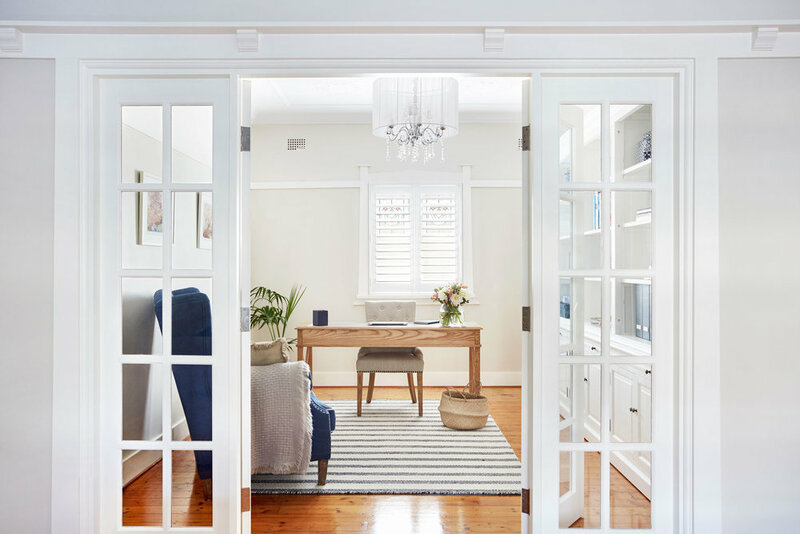 A free standing desk facing out to the living room connects the user of the study to the rest of the house, and the addition of an oversized armchair brings warmth and allows all family members to be able to utilise this room. I am thrilled with the result, as are my clients. A little sneak peak of a recent scheme presented to a client for their beautiful earthy contemporary home in Sydney's eastern suburbs. I am loving terracotta tones at the moment and with blue, it's just so beautiful.